If you plan to sell your home, you want to do all you can to entice potential buyers to choose yours over all the others. But, you also want to make the right home improvement decisions that will give you the biggest bang for your buck. After all, nobody wants to put money into a home without some guarantee that you will see a return when you sell. Consider our 3 best projects for increasing the resale value of your home. For most families, the kitchen is the hub of the home. 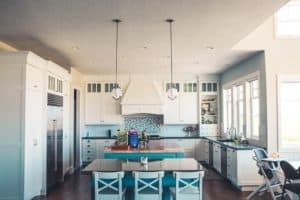 That’s why it’s no surprise that one of the best projects you can tackle for increasing the resale value of your home is upgrading your kitchen. Depending on how outdated your kitchen is and how much money you have to put into it, you can do everything from upgrading your appliances to hiring a contractor to do a complete overhaul. According to HomeAdvisor, the average price to remodel a kitchen is $12,588 – $33,251. No matter how much money you put into upgrading your kitchen, you are sure to see a return on your investment. Not only will you improve your kitchen’s function, but you will reduce your energy costs by adding more energy-efficient appliances. A kitchen renovation also helps you update the look of your kitchen and increase its comfort with more seating or more prep space. In many cases, homeowners recoup at least 70% of their kitchen renovation costs, and you attract more homebuyers when you put your home on the market. Potential homebuyers often look for beautiful bathrooms after finding updated kitchens. Chances are, your bathroom needs a little TLC when you prepare to sell, anyway. Keep in mind that most buyers today look for large showers with multiple shower heads and tile surrounds; many prefer these bathroom updates over whirlpool tubs. HGTV cautions homeowners when it comes to existing tubs. If you’re on a budget, instantly makeover your tub with a wraparound liner that will fit over your existing one. For a mid-range bathroom renovation, replace an outdated shower with a fiberglass tub-shower combination and new ceramic tile. For a high-end master bathroom update, install a soaking tub and a separate shower with dual shower heads. Many homeowners see an 85% return when installing a shower with body sprays and stone tile; others see approximately a 60% return on investment. If you don’t want to completely remodel a bathroom, you will get a return by making minor upgrades such as replacing faucets and hardware, replacing a laminate vanity top with granite or marble, and giving your bathroom a thorough cleaning. Some of the best projects for increasing the resale value of your home are exterior upgrades that boost curb appeal. For example, updating vinyl siding can yield a nearly 90% return on investment. For improved energy efficiency in addition to improved curb appeal, replace your windows for an 85% return. You’ll also get approximately a 75% return by replacing your roof and a 73% return by adding a new deck to your home. Some other ways to improve your curb appeal and stay within your budget include painting your front door a vibrant, eye-catching color, pruning trees and shrubs and adding fresh mulch or landscaping stone, updating exterior lights, and adding landscape lights to sidewalks. You also can camouflage your foundation with faux stone panels or utility boxes with paint to help them blend in with your landscaping or the exterior of your home. Maximizing the resale value of your home is a smart move for homeowners. With a little planning, you can be sure to choose the projects that will give you the best return on investment. Consider upgrading your kitchen, creating beautiful bathrooms, and increasing your curb appeal to make your home more valuable. Mr. Murphy first got into doing DIY projects to save money, but over time he has developed a real passion for this hands-on, intensive work.